A few weeks ago I went on a long day hike with Kim and Jeff near Gramsh to a help Jeff photograph a local tourist site for a website he’s been working on. 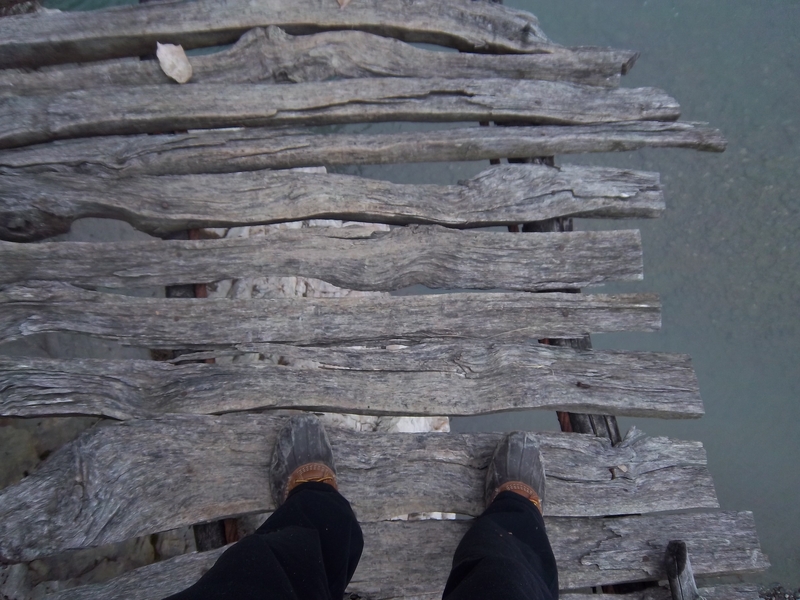 Our destination: a rickety bridge across the entrance of one of Albania’s beautiful canyons. Too bad the water was cold and conditions were snowy, or we could have swum into and explored the canyon within. Kim was brave enough to make it across first – step by step. Not as rickety as it looks, but the wood does creak ominously. What none of us could figure out was – where does this bridge go to? It seems to be in the middle of nowhere, and not convenient to anyone as the river is easily fordable (well…we did get a little wet) just downstream. Also – one side is a basic dead end into a forbidding uphill slope. A man we encountered on our hike back to the road claimed his village was up that hill….but it seems that no one uses the bridge to get there anymore. Seems like it would be great to jump off of for a summer swim…. Just another day in the life of helping develop tourism resources in Albania. That water against the gray rock and bridges is beautiful.